Your Lazydays RV is all raring to go. Now it’s time to show it off at the most luxurious resorts in Florida, Silver Palms RV Resort and Naples Motorcoach Resort. These resorts epitomize fun in the sun, and Lazydays Crown Club members can take a tour of paradise with a three-night Preview Stay at either. Treat yourself to relaxation and revelry among some of Florida’s most pristine surroundings, teeming with towering palms and lush wetlands. Lounge by the pool with poolside bar and cafe. Take a dip in one of the sparkling pools. Play a spirited game of pickleball. Spend time with new friends in the clubhouse, enjoying one of the many monthly activities. Our beautiful and fun-loving resorts provide the perfect spot to park your new, high-end, 35-foot-or-longer coach or fifth wheel. They’re also the perfect place to explore ownership opportunities. If you envision living by the water with a Lakefront Lot offering serene views of blue, an Interior Model, Private Site, or a Preserve Site rich with wildlife and boasting incredible natural beauty, then Silver Palms – located near Lake Okeechobee in Okeechobee, Florida – is ideal for your yearly vacation. Okeechobee is filled with exciting options for entertainment, dining, and shopping, and is a recreational haven, with some of the best bass fishing in the country, great boating opportunities, and unmatched sunsets on the Lake Okeechobee Scenic Trail. 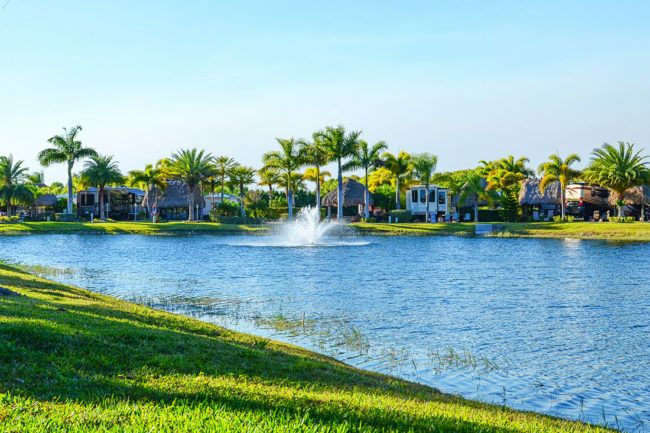 Naples Motorcoach in the prestigious Naples, Florida allows you boat access to the Gulf of Mexico right from your private Canalfront Lot, or incredible nature and views from a Lakefront, Exterior, or Interior lots. Imagine customizing your lot to attune to your lifestyle and provide the perfect space to entertain new friends. Both resorts offer numerous customization opportunities to make your lot your own — ask about outdoor kitchens, entertainment tiki huts, and custom landscaping. 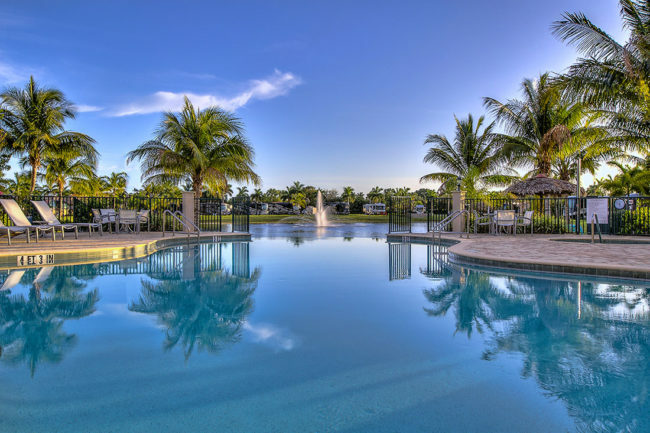 Explore Naples Motorcoach Resort’s surrounding hiking and biking trails, as well as the wondrous city of Naples with its upscale, coastal shopping, dining, and art galleries at the famed 5th Street South, and the Everglades just beyond. Mention “Lazydays Crown Club” to reserve your exclusive, three-day preview stay. For more information, call Naples Motorcoach Resort at 888-323-4985 or Silver Palms RV Resort at 888-323-4967.